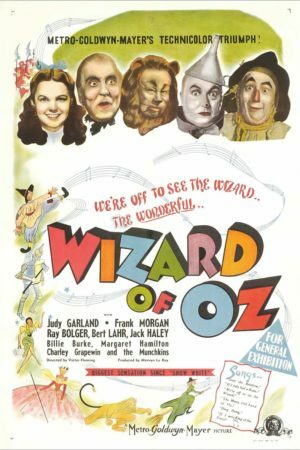 The Wizard of Oz is a film that everybody has watched, nearly everybody has loved, and perhaps as a direct consequence, it's a film that nobody, I think has really seen. Certainly I hadn't; it's surely one of the five movies I've watched the most times,* but I'd never given all that much thought to actually thinking about how it works as a movie. That's to be expected with an iconic treasure of childhood; there's some notion that doing formal analysis on a movie robs it of its mystique, and while I think this idea is simply rubbish, there's no denying that for most of us, watching the film transports us mentally to being around six years old, and six-year-olds are not identified primarily for the rigor of their film-watching habits. But ultimately it's a film like any other film; if it is magical, then that magic is the result of what a team of craftsmen and technicians put together on a set, not because Glinda the Good Witch appeared to Mervyn LeRoy in a dream and gave him the intuition how to put it together. So here's my fool's errand: pretend like I haven't seen the film dozens of times in the last twenty years, and treat it like I was coming to it blind; just another collection of still frames projected at a rate of 24 per second, and ripe for the same frank assessment of its aesthetic as anything else. It's the least respect that I can pay to the film and the filmmakers. No plot synopsis here; I don't have the gall to assume that anybody out there hasn't seen the movie before. But if through some incredible chance you haven't, all I can say is: do so immediately. Make this the very next movie you watch. Literally, unless you're reading this right before going out to the theater. Put it at the top of your Netflix queue, borrow it from a friend. It's not the best film ever made, but nobody's knowledge of film history is even plausibly complete without it. There's a convoluted bit of history involved that many of us already know, but forgive me: Louis B. Mayer wanted a musical fantasy of his own to get back at that Walt Disney fella, and since MGM had the rights to all of L. Frank Baum's Oz stories, that made for an obvious choice. After a number of false starts on the screenplay, cast changes, and even a handful of directors, Victor Fleming was handed the reigns, and he shot all of the color footage before being called away to serve as yet another new director on the benighted Gone with the Wind. The remainder of the script - the opening and closing sequences in Kansas - was handled by King Vidor, once a great silent director whose career started stumbling artistically in the 1930s and went more or less to hell after The Wizard of Oz. That said, he was in his best form here, shooting the soundstage version of the Midwestern prairies with the same affection for the farming life that informed his last great work, 1934's Our Daily Bread. And nearly every one of those shots is paired with its exact opposite: the characters facing the camera, walking towards it. These shots tell the other half of the story: to go someplace new, you have to come from someplace old, and by always setting the two points of view in opposition, the film is cautioning us to always remember where we came from. 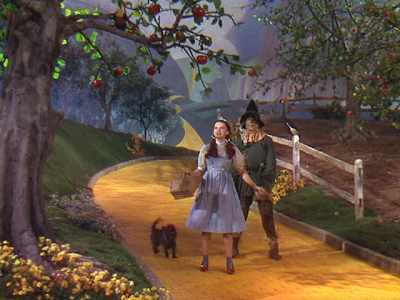 Tellingly, the only exception to this rule of pairs is the very opening shot, in which Dorothy is traveling back home; even there, she turns briefly to watch for Toto, and thus faces the camera for a moment. This is the visual representation of the duality that defines The Wizard of Oz: the desire to be someplace else, but the recognition that at the end of the day, there's no place like home. At first, mirroring Dorothy's journey, the desire to find someplace new is dominant: it's the same urge that underpins the justly-beautiful "Somewhere Over the Rainbow", the song that encapsulates the movie for so many viewers. Over the rainbow, beyond the horizon, anywhere else but here: the primacy of the shots of the road stress over and over again that whatever is coming up is something you really want to find, and the beauty of the song (often cited as the best ever written for the screen - debatable, but there's a lot of truth to it) only adds to that feeling. 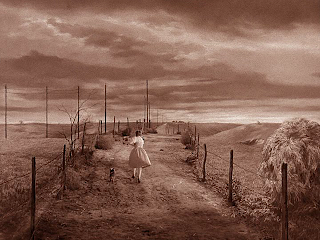 Of course, the Kansas sequences - by far the most accomplished in the film from a directorial standpoint - do make that farm seem like quite a beautiful place to be. Vidor's camera - I'm sure that cinematographer Harold Rosson had something to do with it, but it really does just reek of Vidor - frames the quaintly run-down sets with the greatest of care, and that sepia-tone monochrome gives the whole thing a rich, inviting quality. 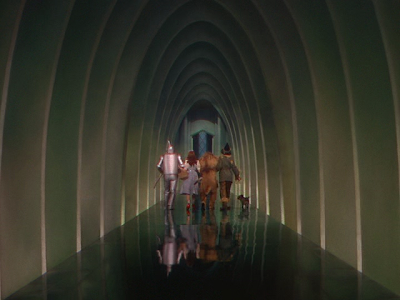 Besides that, there's the film's transition of colors: at the beginning, when Oz is a marvelous new place, everything is bright and beautiful. But the further along we go, the more color is leached out (the Emerald City may be lovely, but it's so oppressively green! ), culminating in the dark, unpleasant forest and castle where the Wicked Witch of the West makes her home. By this point, everything visually appealing about Oz has been stripped away: the yellow brick road replaced by omnipresent greys. 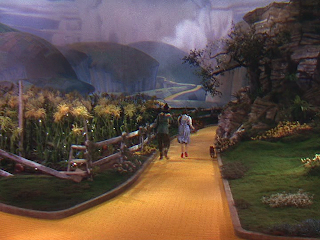 Over the course of the film, Dorothy realises that she wants to go back to her farm, and the gradual degradation of the color palette follows her arc. Ah, color! the most important, influential, recognisable element of The Wizard of Oz. Three-strip Technicolor was a new technology in 1939, but not absolutely brand spanking new: it was first use in a feature in 1935's Becky Sharp, a film with very little else to recommend it. By 1939, there had already been at least two truly great films that made excellent use of the splashy excess of the process - Disney's animated Snow White and the Seven Dwarfs released at the tail end of 1937, and Warner's The Adventures of Robin Hood, from the summer of 1938 - but I'd wager that it was with The Wizard of Oz that we had our first outright color masterpiece; that is, a film that doesn't just use color as a snazzy gimmick, but as a storytelling element in it's own right. Not that the gimmickry isn't there, and still damn snazzy 70 years on: the shot where Dorothy walks out of her sepia colored house into the rich, garish colors of Oz is a magnificent bit of sleight-of-hand involving an double in a miscolored dress, and the transition is still enough to amaze all but the crabbiest viewer. But that's just razzle dazzle. I'm talking about actual, legitimate uses of color as a tool, and The Wizard of Oz does this in subtle, virtually unnoticeable ways. Take Dorothy's celebrated gingham dress, with its white and blue checks. Once we leave Munchkinland, her dress is virtually the only source of blue to be found. The sky is blue; the faces of the flying monkeys and certain details on the Winkie guards' uniforms are both turquoise, which is close enough that I'd feel like I was cheating if I didn't mention it. But that's it. And even amongst the Munchkins, Dorothy is unusual for having a gentle shade of blue whereas every color on display in the village is a bold, "look at my Technicolor!" shade. So in all of the film's color sequences, Dorothy is being marked out as a stand-out element; she is not part of the palette of Oz. Thus we are subtly reminded throughout that she is an alien here, and that she must return to Kansas because that is part of who she is; her identity (for in a visual medium, identity is based on visual signifiers) has no place in this other world. Also, just a fun little note, did you ever stop to think of the colors of her outfit? White blouse, blue and white dress, red ruby slippers. Red, white and blue. All-American, that's our Dorothy Gale. And then, there's the witch. In a medium based upon the projection of light, black is a powerful statement to make. It is, after all, the total absence of light, the total absence of color; it is a vacuum in the middle of the screen. It devours the imagery around it. Sure, there's the traditional equation that "black=bad", but there's more to it than that. Black overpowers everything that isn't black, and this is why it makes for such iconic, elemental villains. Quickly, name a Disney villain! Now, I can't prove you picked the Queen from Snow White, Maleficent from Sleeping Beauty, or Ursula from The Little Mermaid, but I think there's a much better than even chance that you did. Black is memorable, powerful, primal. There's something a bit trickier to it than just "black is good for villains". Take a good long look at the contrast between Dorothy and the witch. Both characters are defined by two colors: white and blue, black and green. Black and white are opposites, that part is obvious. But what about the relationship between green and blue? They're not "opposite" colors; they're both primary colors of light, in fact. Green, blue, and red. 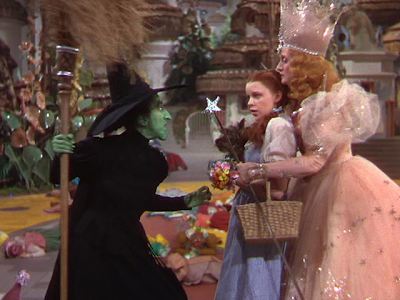 And of course, in this film, the witch and Dorothy are in contest over the ruby slippers, a definitively red MacGuffin. It's worth pointing out, I think, that the witch is often paired with red objects; the slippers, the plume of smoke that marks her exits and entrances, the hourglass counting out Dorothy's life. Basing the conflict around a scheme of primary colors is tremendously subtle (and likely unintentional), but deeply effective. A last point - because this is getting much longer than I'd intended - the fakery of Oz. In several places, the fact that Oz is a movie set is quite impossible to ignore. 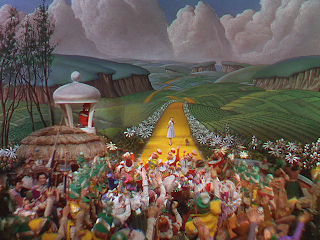 Very frequently, the scenes are lit with obvious shadows from multiple light sources (especially in Munchkinland and in the Scarecrow's dance); at times there are almost unignorable shadows from the camera and film crew. None of this happens in the Kansas scenes. Now, the cynic might just say that's the difference between Victor Fleming, a decently talented MGM hack who lucked his way into two hugely iconic films, and King Vidor, one of the most talented American directors of the 1920s. And maybe that's the explanation. But at the same time, this transparently set-bound Oz, with its obvious backdrops, is a nice contrast to the reasonably naturalistic looking Kansas sets. They are what's real, Oz is not; and by stressing the falsity of Oz, the film is underscoring the extent to which "there's no place like home". The message is quite simple, and obviously stated; but the fact that so much of the film's visual aesthetic bears out the words that Glinda so blandly states at the finale goes some way to explaining why The Wizard of Oz still works on such a basic, timeless level. Of course every great film does the same thing, using the visuals to communicate the message; that's one of the requirements for being a great film. But sometimes it does to remember that a film we all grew up on is a great film, nostalgia and all.